In-situ Assessment - Tunnel Scanning - Tunnel - Projects - Home - dibit Measuring Technique USA, Inc.
A tunnel scanner survey of 5 tunnels that are located along the swiss national road N16, between the cities of Biel and La Heutte was carried out in the months of February and March of 2013. The survey took place only at night with one lane open for traffic. 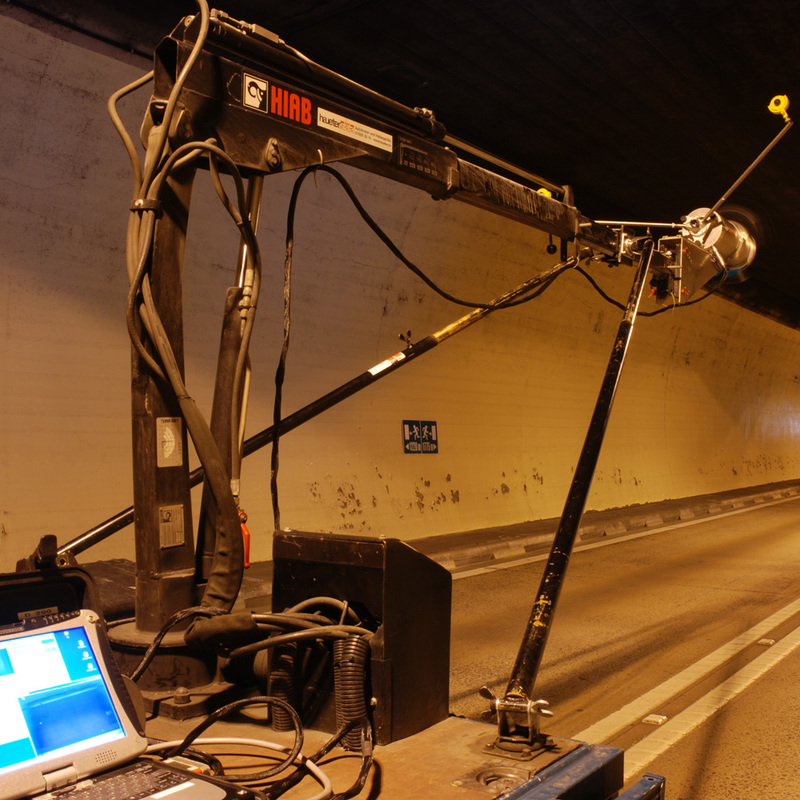 The second lane was shut down and used to set up the dibit tunnel scanner system LSC 4200-MRF. The scanning took place via a static set up routine and the stop & go method on the closed lane. The fact that one lane was kept open during the survey works, traffic delays were kept to a minimum. The complete surveyed distance totals in 2,939 meters including the roadway and an additional 300 meters of roadway outside the tunnel. Dibit Messtechnik GmbH performed a tunnel alignment adjustment and used the scan data to determine a new best fit alignment. 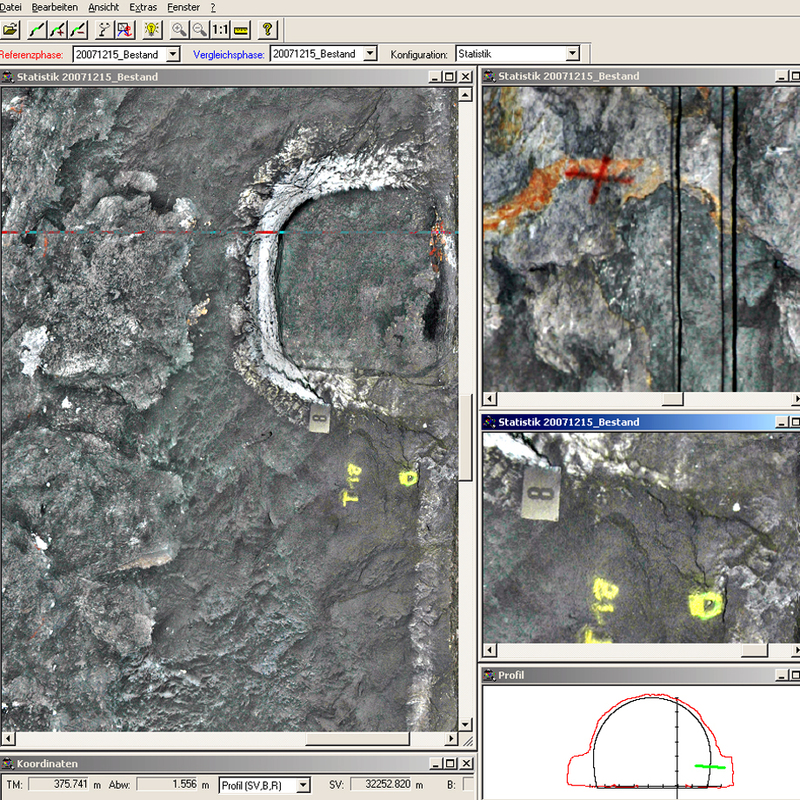 In addition, deliverables were submitted in form of ortho-photo maps, contour maps, cross sections as well as AutoCAD profile and longitudinal sections. 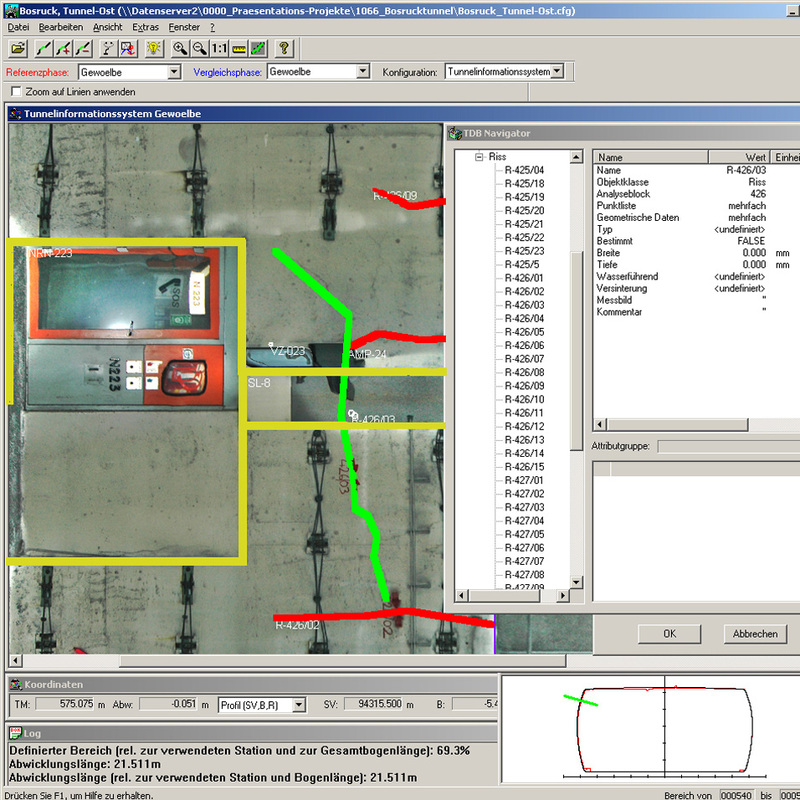 As a last task, a clearance analysis and verification was carried out using dibit 7 software which allowed running the clearance analysis with the actual dynamic clearance envelope. Perjen Tunnel, which was built in the early eighties, should be extended by a second lane in the same direction, respectively a second tube should be constructed. For the planning to be performed, detailed information about the existing construction work was necessary. 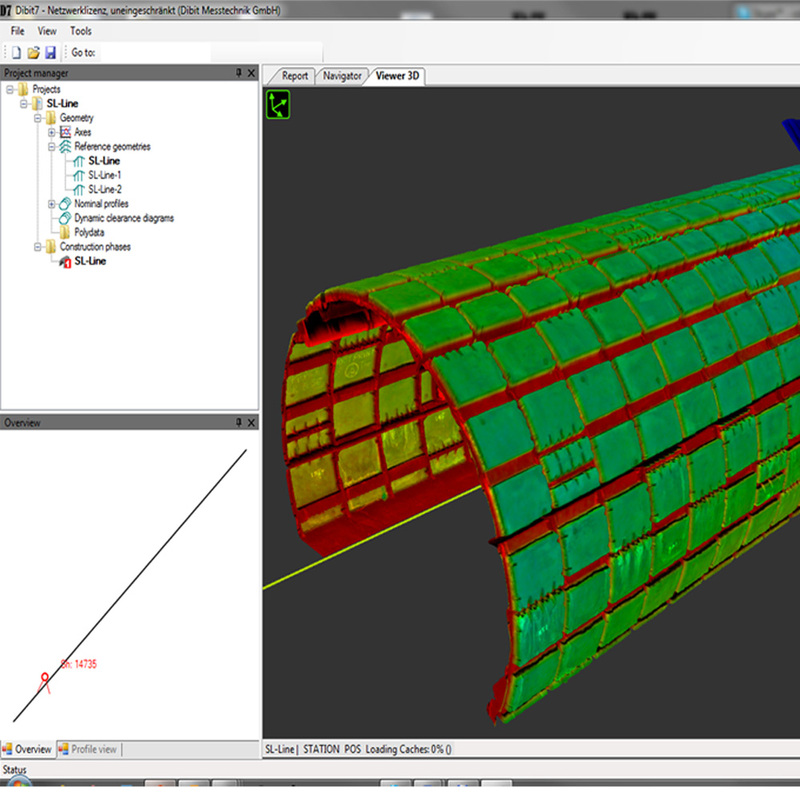 Therefor a full-area geometrical and visual tunnel scanner in-situ assessment of perjen tunnel and lötz gallery was implemented. 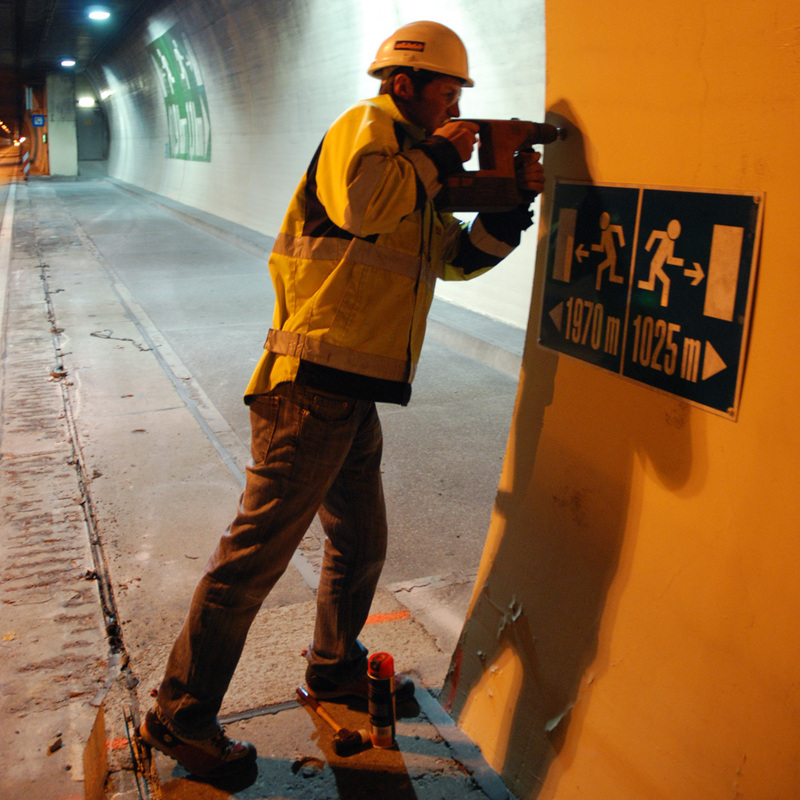 These measurement works were accomplished in the complete closed tunnel. 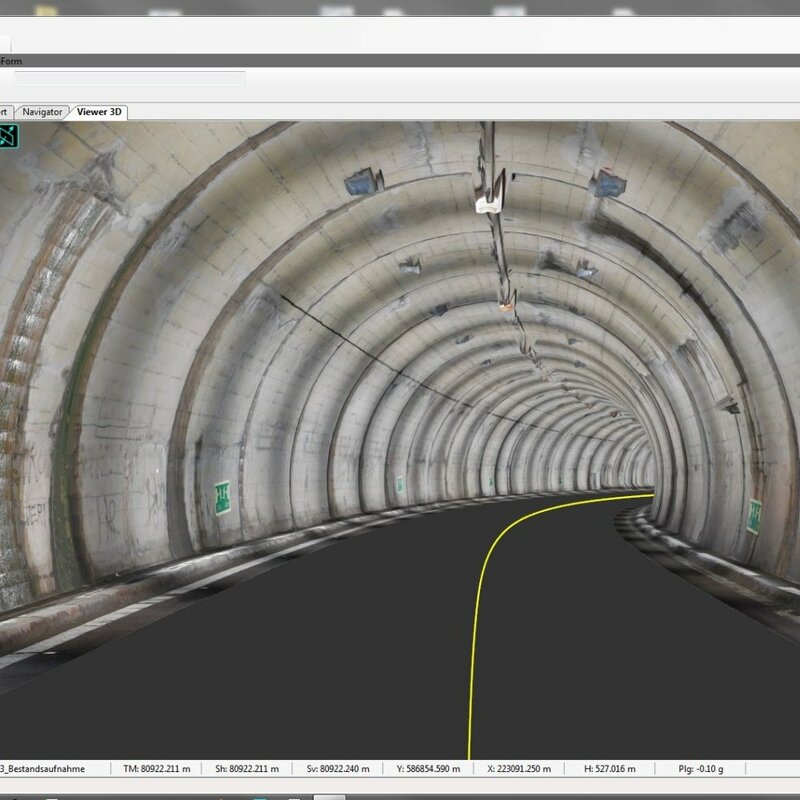 The in-situ assessment data of the tunnel geometry, in particular of the existing traffic lane and the road axis were determined. Additional, components and construction damages were outlined with the digital tunnel information system, dibit TIS. 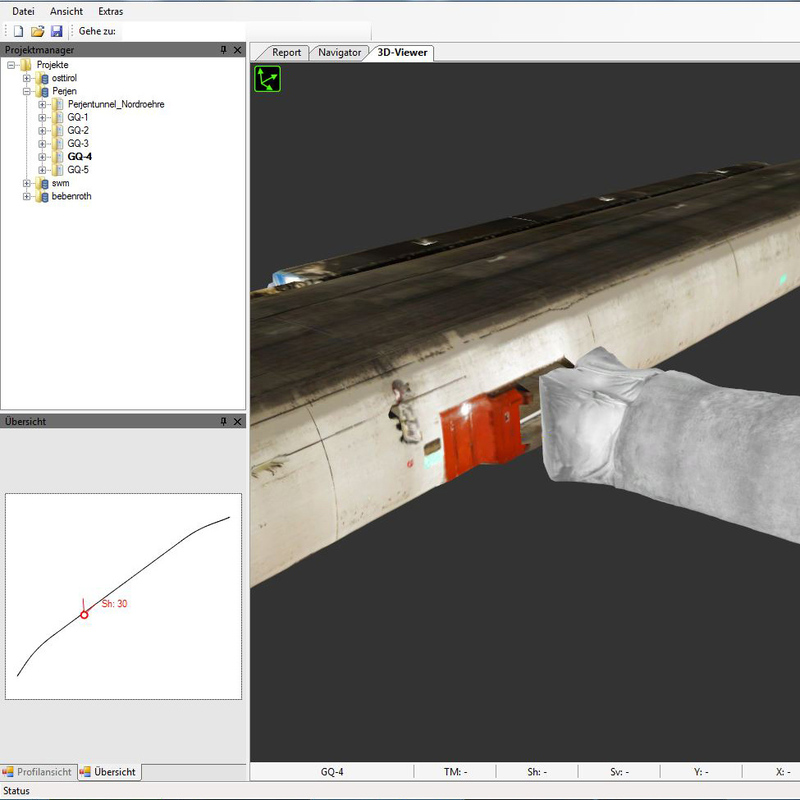 From the photographs, acquired during the scan, a high resolution, digital tunnel model in true colors was generated, which, in connection with the dibit 3D-viewer enables for a virtual inspection and a dynamic clearance check. The client recieved the results in digital, as well as in analogous form and at the planner's hardware the viewer software was installed for implementation of dynamic analysis. The Bay Area Rapid Transit (BART) is San Francisco’s subway system which connects the major cities in the bay area. Part of the Central Subway project, requires the construction of two, approximately 21 ft-diameter tunnels below the two existing Market Street BART subway tunnels. 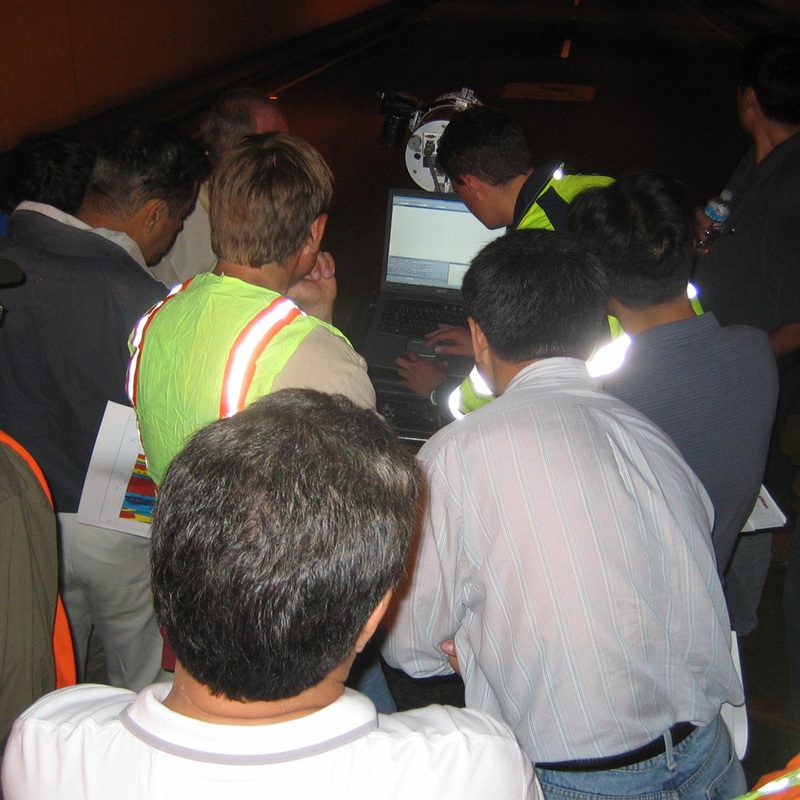 In order to record the condition of the BART tunnels, which are 7.5 ft above the proposed Central Subway tunnels, an in-situ assessment is required to determine and document the current alignment and elevations of the tracks and third rail, the shape of the fabricated steel plate segmental lining, and the physical condition of the BART tunnel lining, track bed, and walkways. 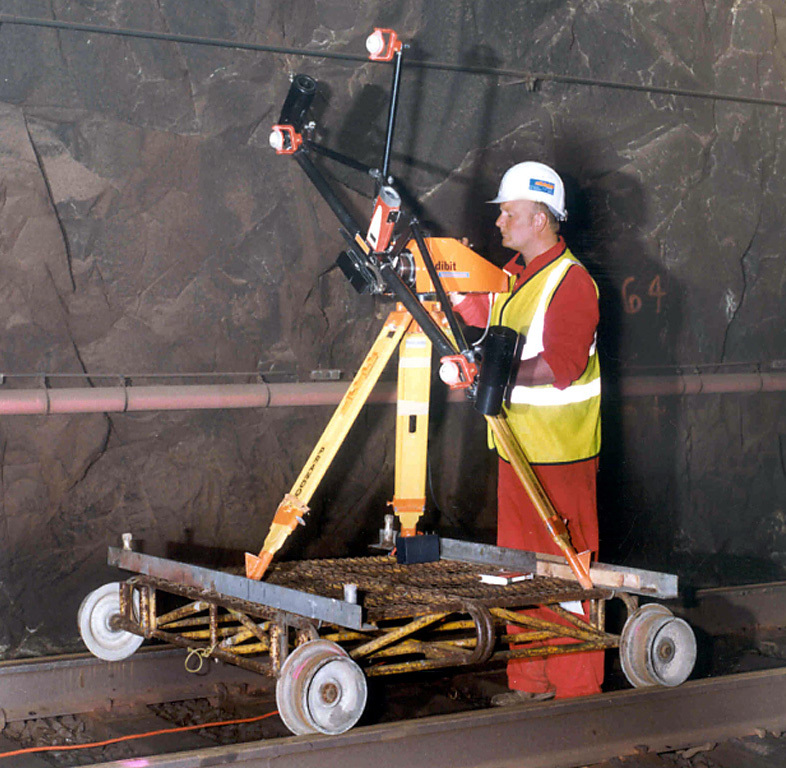 The dibit laser scanner LSC 4200-MRF was used to obtain a comprehensive survey of the existing northbound and southbound tunnel lining. 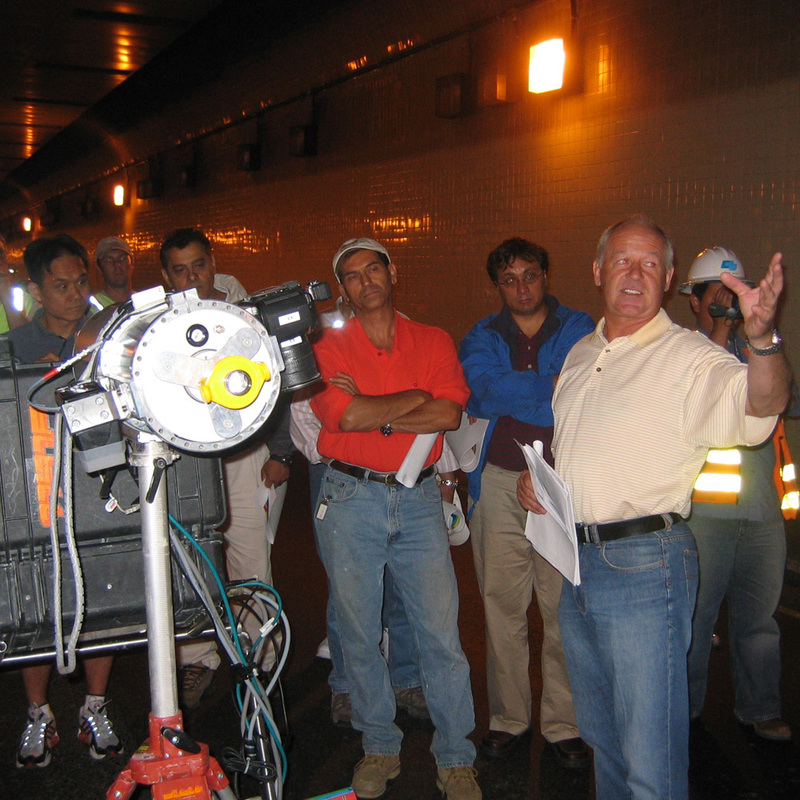 The surveyed tunnel sections, which are 100 m long, took 2 four hour shifts during BART shutdowns at night. The laser scanner set ups were set every 2 m to minimize shadowing effects caused by the steel lining segment flanges. Data processing included point cloud registration, stitching scans together to form the 3D model and creating records that show the current lining condition as well as deviations caused by deformations over the years to the original design. In addition, the final scan data was geo-referenced to the BART survey network and stations. A 3D-tunnel-scanner-survey of a 150 meter section in the 3rd bore at Caldecott (2 surveys over time of the same tunnel section) to WBS 240.10 was implemented. Each survey required two night visits to the tunnel plus one day of preparation and two days for analysis of data and reporting. The 150 meter section of the 3rd bore had experienced heaving in the past and repairs were made. New evidence of road undulations and bulking of the sidewalks suggested continued movement in the area. 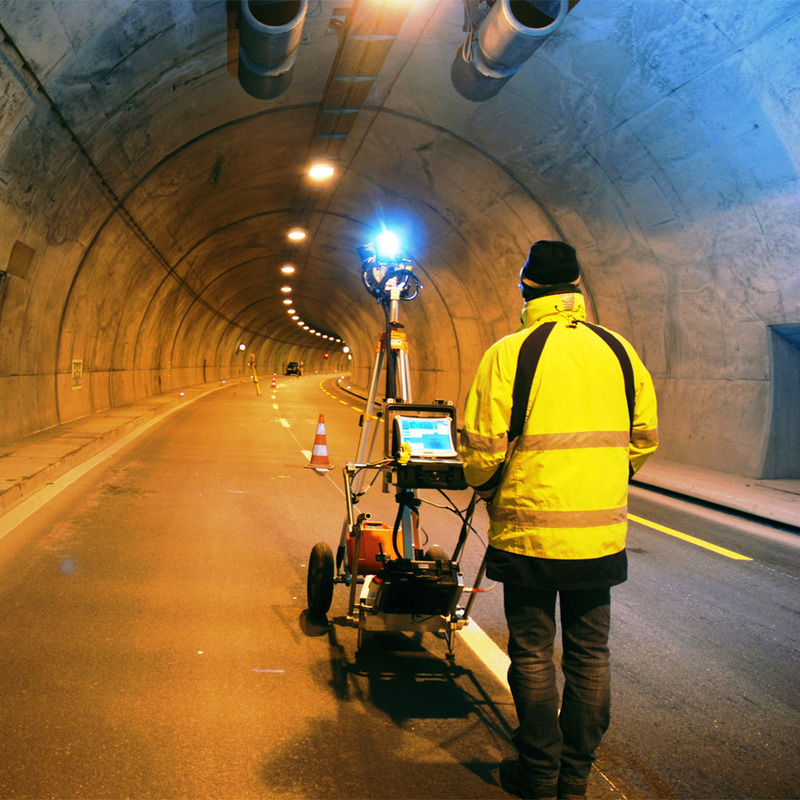 Dibit provided a full 3D-survey of the tunnel surface and its undulations. With the follow-up survey, deformations were identified, measured and plotted. The data assisted in the understanding of where movement was taking place and determining why it is occurring also for what changes may be need in the design of the 4th bore to avoid a similar occurrence. The catenary of the Ofenauer Tunnel should be retrofitted and updated. 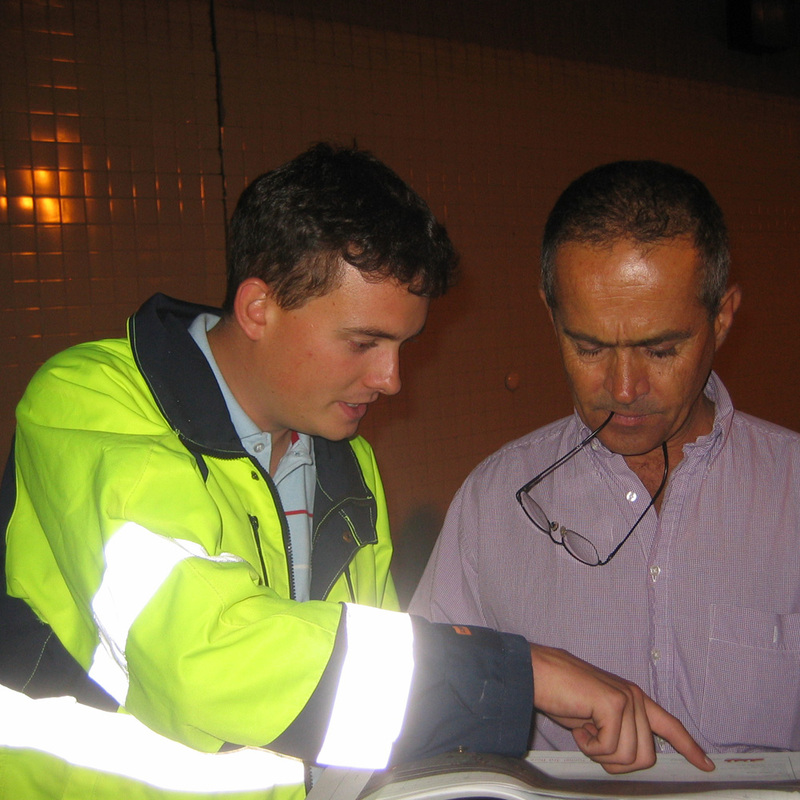 As planning guide the client needed an in-situ assessment of the tunnel surface and the actual track position. From these data Dibit Messtechnik GmbH should deliver profiles of the tunnel geometry and clearance profiles from sections, appropriate for retrofitting. 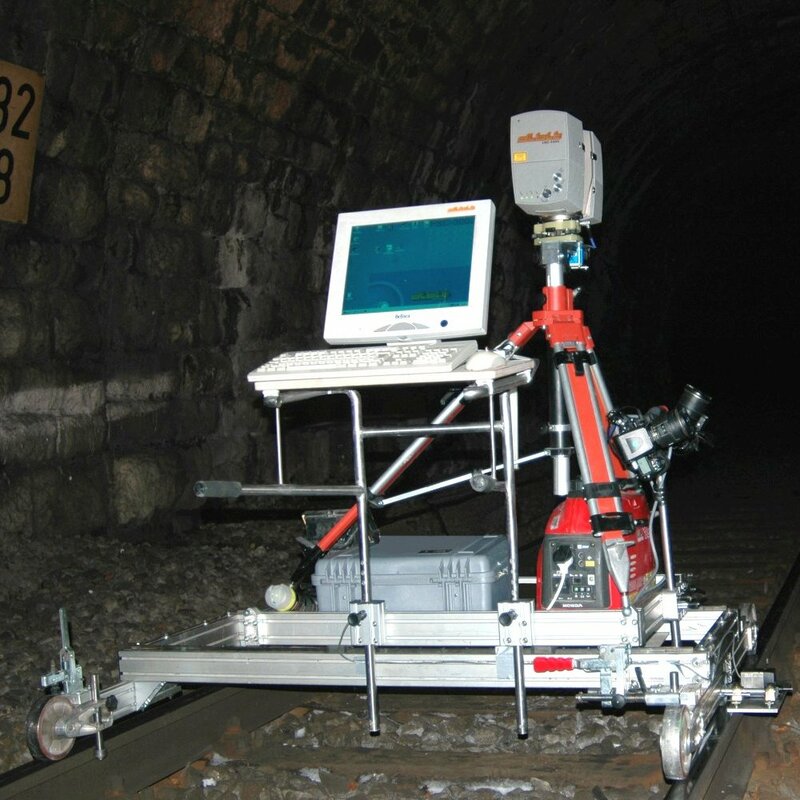 Because of these performance requirements it was obvious to implement a comprehensive geometrical and visual tunnel scanner recording of the tunnel surface. To depict the documentation as effectively as possible it was necessary to choose an image resolution of at least 5 x 5 mm. For the geometry survey a point resolution of 1 x 1 cm was sufficient. Because of increased safety rules and only short interruptions of the rail traffic, the recording of the track axis and the tunnel geometry had to be split to several nights. 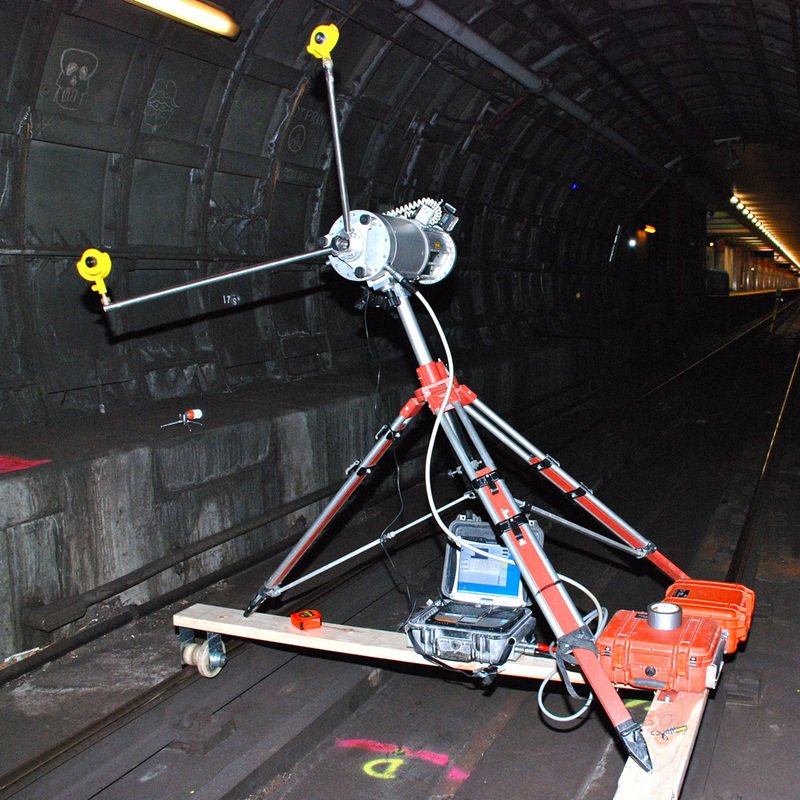 From the recordings the actual tunnel geometry was derived and the adherence of the clearance profile regarding to the actual track position was examined. In accordance with the planner possible positions for the catenary upgrade were appointed from the image documentation and the 3D-model. Over 1 km of its length the eastern bore of the Bosruck Tunnel (A9 Pyhrn highway - Bosruck section) leads through the geological layers of the Haselgebirge. This fault zone caused substantial long-term deformations of the lane and the tunnel. 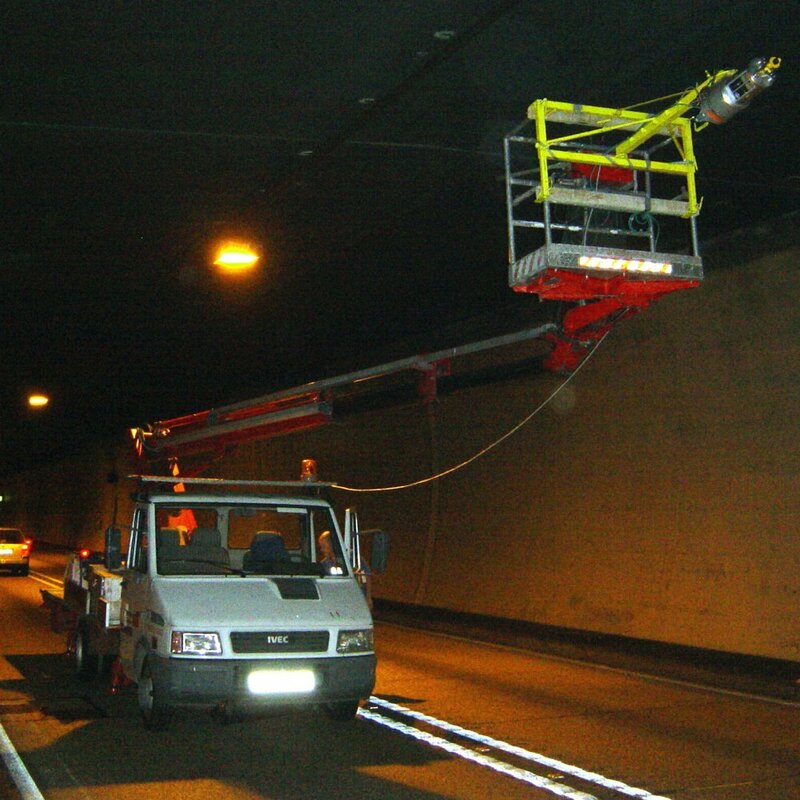 For the planning of the general refurbishment the client needed a comprehensive in-situ assessment of the tunnel with simultaneous defects detection. The in-situ as well as the damage assessment of the tunnel served as an essential decisison to support the imminent reconstruction. 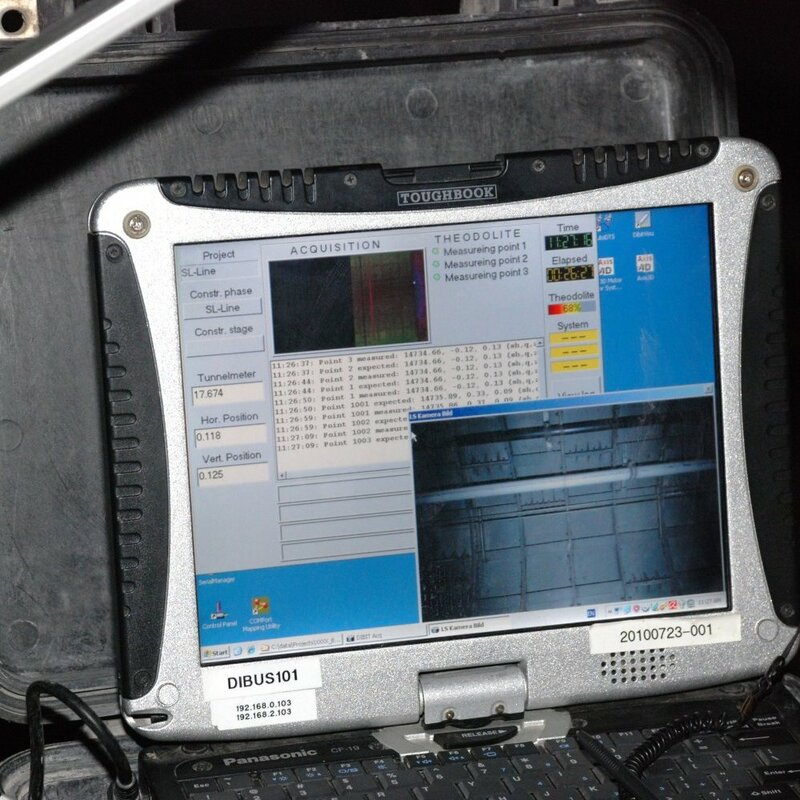 Two dibit tunnel scanners LSC 4200-MR and dibit CAM systems where used during a 33 hours total tunnel block for the survey. The geometry recording was processed with a point grid of 10 x 10 mm, images were processed with an image resolution of 5 x 5 mm and were superimposed on the geometry of the tunnel. 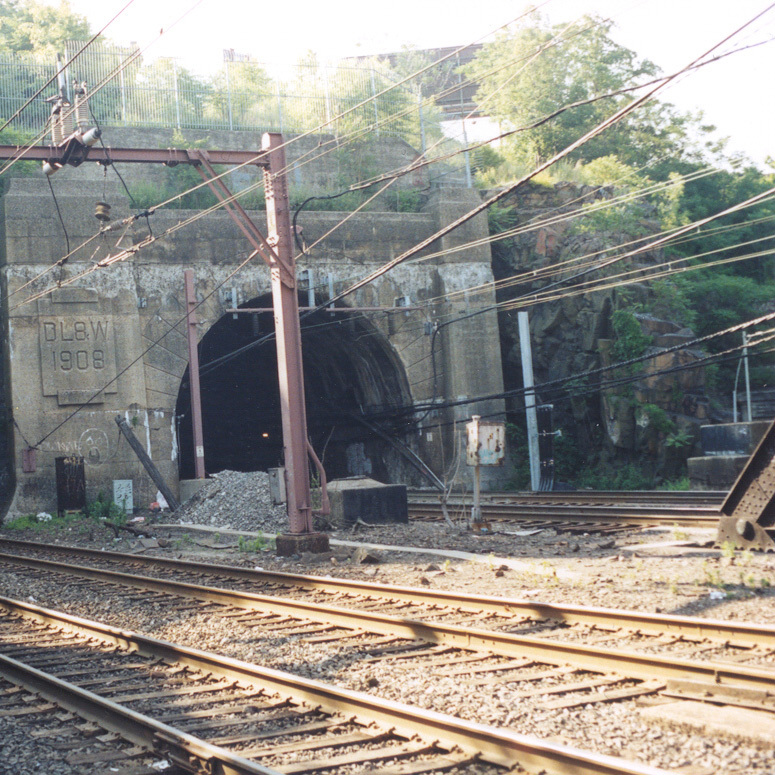 The over 100 years old North Bergen Tunnel (built in 1876) suffered from the impact of age, water, and ice. The tunnel surface was primarily exposed rock. Short sections of the tunnel were covered with a thin layer of shotcrete and other sections were supported by a brick lining. The brick sections were seriously deteriorated. The JV Merco - Obayashi was hired to construct a new shotcrete lining with lattice girders for the entire tunnel. To insure enough clearance for the installation of the new shotcrete lining, an accurate as-built survey was necessary prior to the construction works. 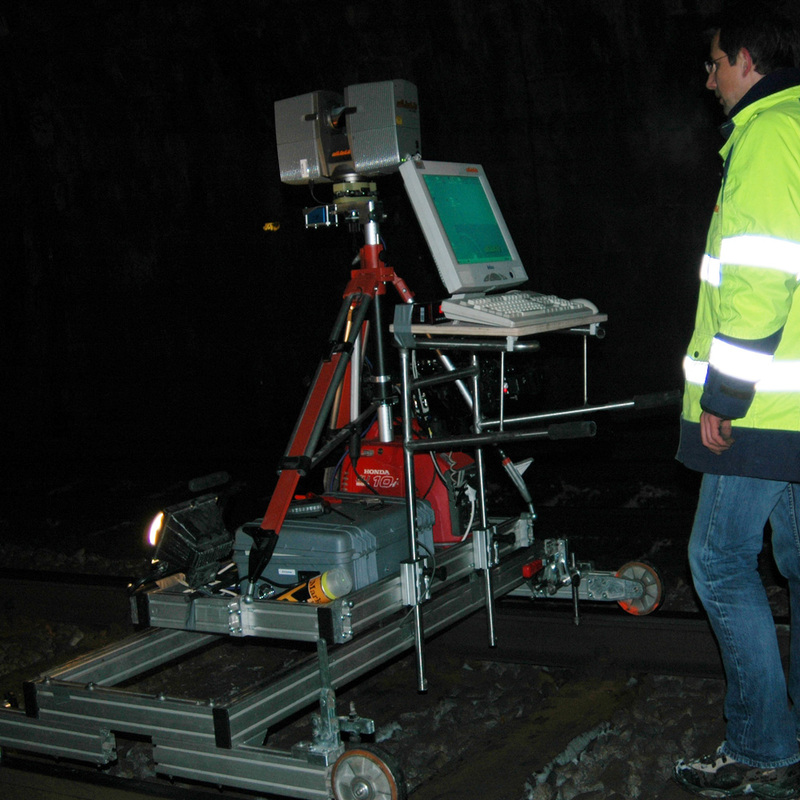 The survey was executed with the dibit Tunnelscanner for the complete tunnel. 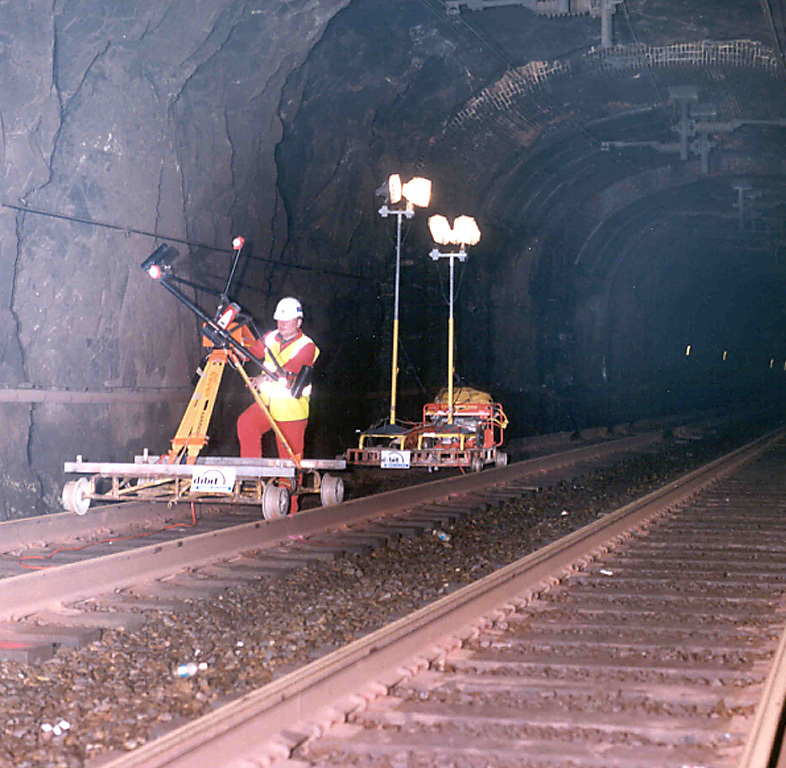 The dibit survey ensured accurate measurements of the cross sections of the tunnel, it provided accurate calculations of the quantity of rock to be excavated; and it provided the information to calculate the quantity of shotcrete needed for under and over profile areas.